The time for dull public-addressing is over! 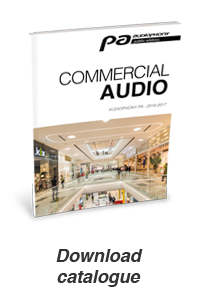 The "Commercial Audio" brand takes on full significance with AUDOPHONY PA. The refined aesthetic, the discretion and the incredible sound quality of our PA systems are endorsed by many smart and trendy places, but can also be used at home. Our "Commercial Audio" series gives you high-quality technology to broadcast music or information in bars, shops, public areas, and more! Let's not forget we also offer very simple products, to be used both indoors and outdoors. We're aware of you nor, and that is why we created AUDIOPHONY PA Commercial Audio.